The Celts placed value and symbolism on all things in the natural world around them, and animals were a huge part of this. Throughout their history, Celtic animal totem symbols could be seen in various aspects of their daily lives, such as on jewelry, tapestries, clothing, and artwork, to name just a few. As symbols, totems, and even zodiac signs, animals serve as valuable symbols, as they remind us of specific qualities and traits that we want to demonstrate in our daily lives. When we understand the meanings associated with each individual animal, we can adopt those symbolic meanings into our lives – an idea that the ancient Celts recognized long ago. Celts believed that these animals, when in their natural environment, provide us with a focus in our own lives. They bring our attention to something that we are lacking or have been neglecting and assist us in finding our true and virtuous path through life. As a people, Celts understood the various meanings and traits of each animal and used this knowledge to channel the specific insight and qualities that they required. The Celts recognized the reciprocal nature of forming a spiritual relationship with an animal totem and understood that one must be receptive in order to receive its messages and meaning. One such animal was the bull animal totem. As a symbol of strength and an uncompromising will, the bull was often viewed as a masculine symbol of virility and stubbornness. On the other hand, it was also though to be a sign of fertility for women. As such, the bull was often depicted on bedroom items such as sheets, robes, and pillows, to name a few. By doing so, it was thought that the man and woman would experience increased sexual strength and endurance, which would lead to reproduction. Additionally, bulls provided the Celts with a large food source, symbolizing wealth and abundance. The cat totem was another symbol that was appreciated across several ancient cultures, including Celtic, Egyptian, and Roman. Stoic and mysterious, the cat was deemed the guardian of the Underworld. It was the keeper of secrets, the depth of its knowledge incomprehensible to humans. By contrast, the dog was considered a most loyal animal. Appropriately deemed “man’s best friend”, the dog stood for companionship. They were also thought to bring health and good luck. Perhaps the most ancient creature in Celtic lore is the griffin. Part eagle and part lion, this animal represented the dualities that exist in life: the good and the not so good. The griffin symbolized such valiant qualities as nobility, justice, strength, and vigilance, making it a prime choice as a depiction on the outside of stone tombs. In this sense, the griffin could be called upon when the Celts required such qualities. However, if they abused this privilege, the griffin was thought to bring the wrath of the gods and such negativities as gluttony, vengeance, and ferocious violence. The Celts also used the Ogham, or language of the trees, to assist them in comprehending the workings of nature. Some symbolic animals appealed to both the daily lives of the Celts and the sacred Ogham language. One such example is the butterfly. 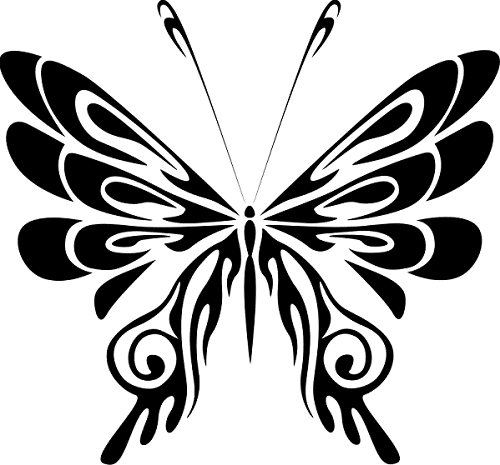 Traditionally, the butterfly was seen as the ultimate symbol of transformation, inspiration, and rebirth. This spoke loudly to the Celts, who highly regarded the concept of the cyclical nature of life and death. They viewed life as recyclable, both physically and spiritually. Life is full of transitions and metamorphoses, and the butterfly demonstrated this by the very nature of its life. Through the lens of the Ogham, the butterfly corresponded to the ash tree. In this sense, the butterfly was seen as a reminder for humans to go through life at their own individual paces. Often times, we live our lives to a specific and detailed schedule, without taking time to move slowly and gracefully, appreciating our surroundings. The butterfly does not do this; rather, it speaks to us of the importance of our inner evolution. Without it, we cannot recognize which path is correct for us. By hearing ourselves, the Celts believed that we could move along the correct path with poise and grace. Another popular animal symbol in both laymen and the Ogham language was the goose. Like other birds, geese were very common sights among the lush greenery of Ireland. These migratory birds in particular, though, proved to provide the observant Celts with much symbolism and guidance. The migration was indicative of the transitory nature of all that surrounds us. On an individual level, this urged the Celts to embrace changes around them. By becoming aware of and accepting changing moods, opinions, and thoughts, they enabled themselves to experience a true sense of wholeness. In becoming one with your thoughts, the Celts felt that you could experience oneness with your actions. Also, the goose was thought to be indicative of the importance of a strong hearth and home, as they always return home in the spring season, the final phase of migration. This would explain why the goose was displayed in the homes of warriors to ensure their safe return from battle. The list of animals that were symbolic to the Celts is seemingly infinite. Like all other symbolism, though, it is subjective. Any animal can speak to any of us. We need only open our minds and listen.